Your brother may be one manly dude, but Christmas brings out the softer side in us all. There's that moment of anticipation as the present gets unwrapped. Then you know, from that first look, if you did good. We all hope to score gifts for our loved ones that melt hearts this Christmas. Yet somehow that task feels harder to do with gifts for dudes, especially Christmas gifts for a brother. 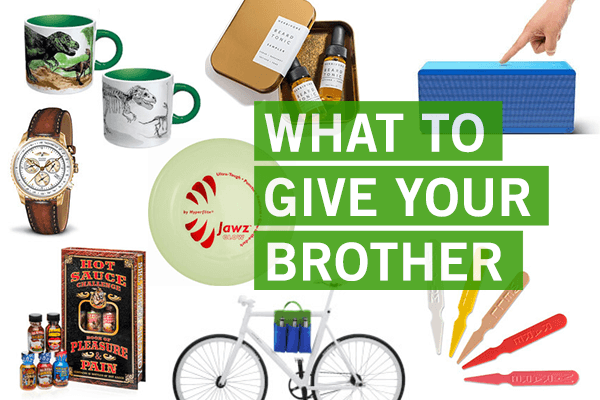 Here are playful ways to think about choosing a gift that your brotha will love. You two may have played the game endlessly as kids. It's simple, think about how your brother would answer questions if given the choice. Helpful questions include: Would your brother rather have a practical or fun gift? Would he rather cook (then find a helpful kitchen tool) or eat takeout (then send him yummy meals delivered to his door)? Would he rather watch sports or movies? Using this game of questions makes it easier to focus on the perfect Christmas gifts for your brother. You may not know everything about your brother, of course, but think about things he's said in the past that he's never done (and hopes to do). Short of gifting him a tattoo, there are so many experiences and activities you could gift him - from a wild day of skydiving to a ride in his dream car. Rather than put all your money in one basket, think of a theme you know your brother would love (Stars Wars, baseball, BBQing). Then pull together a few smaller gifts all related to your theme. It's always fun to have more than one gift to open. And you're more likely to hit on a gift he loves, rather than strike out completely. He may have been crowned the jokester in the family. Take a cue from his book and think of a funny way to keep him on his toes with your Christmas gift. Maybe wrap a box within a box within a box, so he has to dig out his gift. Or give him a gag gift, with a practical gift waiting in the wings. Check out our birthday gift guide for brothers and our collection of most popular gifts for brothers for all occasions. When you're Christmas shopping for your brother, you want to cut through all the clatter to find a gift that will thrill him. And let’s face it, a striped tie is not going to thrill. Your bro is a great guy who deserves a gift that's anything but generic. That's why we searched high and low for gifts that focus on the manly man that you call your bro. He deserves a cool surprise under the tree.